Enjoy environmentally-friendly janitorial and maintenance services at your facility. Learn more about what we’ve done for property managers across the country. ESCFederal provides turnkey Green solutions that are eco-friendly, safe, effective, and very affordable. With ESCFederal’s comprehensive Green cleaning program, you no longer have to compromise on cleanliness to be eco-friendly and safe. Plus, it no longer has to cost a premium to do the right thing. Our combination of green cleaning products, technologies, and training make it very affordable to have a clean, hygienic atmosphere that’s also environmentally friendly. When it comes to facility maintenance “going green” begins with purchasing environmentally sensitive cleaning supplies, agents, and equipment. The materials you use must be disposed of or recycled and the tools may need to be different from traditional ones. For example, precise dispenser systems ensure that cleaners aren’t used too liberally. Housekeeping and janitorial services can often save as much as 50% of the volume of cleaning solutions, compounds, and agents. Green cleaning isn’t just about being “natural,” after all arsenic and uranium are natural but nobody wants to be anywhere near them. A certified green cleaner lessens its environmental impact at all stages of its life cycle including the packaging and methods of disposal. Traditional cleaning agents have been proven to impact human health negatively including associations with cancer, respiratory illness, reproductive disorders, and skin irritation. In short, there are handling, storage, and recycling issues that need to be managed. Green cleaning products solve many of these problems. 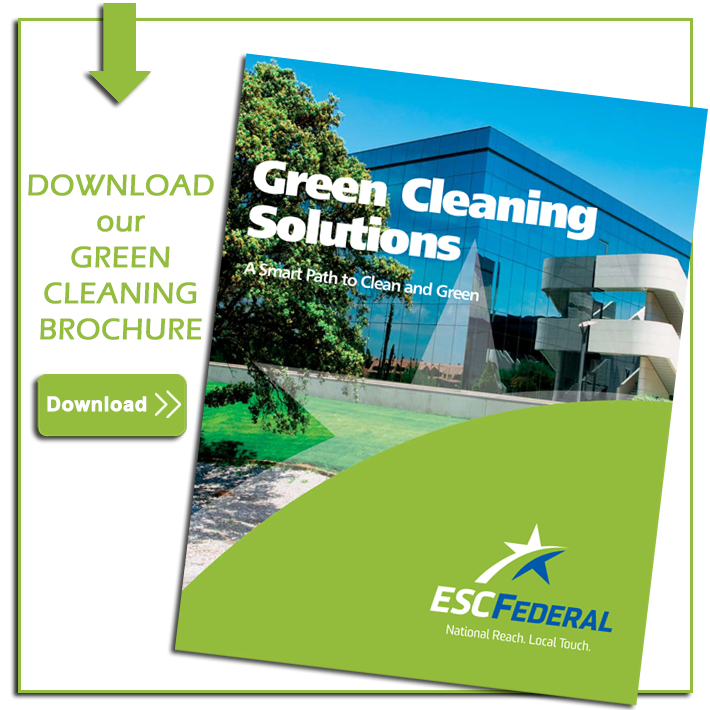 ESCFederal helps companies provide a comprehensive cleaning and maintenance program that fits even the most stringent green objectives.